Two friends sent me David Brooks’ column, “Going Home Again,” which appeared in last Thursday’s New York Times. Rarely does one person recommend a column out of the blue, so when two astute people send me one I take notice. Brooks wrote about hearing the British writer-musician, Sting, speak at the TED conference in Vancouver, British Columbia. 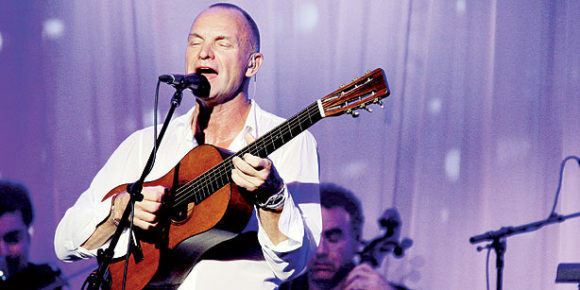 Sting spoke about how years ago he lost his creative juices. He just could not come up with fresh exciting music. At first it was a short flatness, then weeks and months of drought. It stretched into many years of producing nothing vibrant, nothing that made him happy or excited an audience. Finally he started thinking about his childhood in the north of England. He lived on a street that led down to a huge shipyard where giant ocean-going vessels were built. He circled back to childhood and his muse returned. He has a new musical, “The Last Ship,” which he is performing in New York and will soon be on Broadway. I think back to high school baseball, being benched by my coach after a disappointing pitching performance, and then quitting the team in anger. It was perhaps an immature response by a 16-year-old boy, but it quickly led to writing sports for the high school paper, which led indirectly to becoming Sports Editor of The Michigan Daily, which inspired me to be an off-and-on writer for 50 years. The seeds of our creativity lie in our childhoods but they are nourished by experience. And from an economic and esthetic standpoint it is creativity that gives us joy and success. When I visit my sister, Susan, I always ask her to play the piano. She is a gifted musician and I love to hear her play. Her music stirs my memory and my soul. She plays songs from the great musicals like “My Fair Lady,” “The Sound of Music,” “South Pacific” and “Oklahoma,” and I sing with her and cry. It brings back memories of singing with my Dad and Sue when we were kids. There is a strength lingering in those memories. I still sing a lot even if I forget the lyrics. It gives me pleasure and ease. It makes me feel more connected to myself. When I have that feeling of peace and connectedness I feel more access to my uniqueness and personal vision of the world. I had a discussion today with a fellow who builds special attachments for screw machines. He gets fired up when he talks about thread milling. Now he’s starting a new screw machine rebuilding business. I told him he was crazy to get into rebuilding because he is deflecting himself from his creativity to focus on the mundane, for which he was going to be paid by the hour. I sincerely believe if you have a muse you need to use it and use it hard, or it will evaporate or hide. I hope you all are in touch with your special gift. If not, maybe you should follow the bread crumbs back to your roots. Question: What songs bring back sweet memories for you? My highest interest in high school was playing the drums…oh, and that certain young lady to whom I’ve been married for 46 years. I recently bought another set of drums and I’m playing old sixties recordings of the Animals, Rolling stones, James Brown etc. My goal as a high school and college kid was to be a composer of serious music. Life got in the way and I took a tool and die apprenticeship with the thoughts of doing one job by day and my passion at night. That didn’t quite work out. I kept some attachment to music, but I had to feed my family with the day job. I don’t regret going into tool and die, it has been very good to me. Now, some 34 years later, I have begun noodling around with my music a little more. Perhaps the circle is going to close. PS–Lloyd, I know that I speak for many. We really enjoy blog. It makes us think, remember, and occasionally bring a tear to our eyes. Once a musician, always a musician even when not playing consistently. A musician listens to music with different ear than a non-musician(not being critical). That special note , or chorus or lyrical phrase opens the heart to an awareness of our environment. So I will continue to play my bass when I can and dream the dream of making it big but realizing I’m where I’m supposed to be now. Definitely Stairway to Heaven. I was a 14 year old girl, slow dancing with my future husband at the teen dance, while my dad’s headlights shone through the window because he was waiting to pick me up! Just the first few opening bars takes me right back there….. I can sing Nat King Cole’s “Unforgettable” all day long. “Only 16” sung by Sam Cook haunts me. But all time favorite, “Take Me Out to the Ballgame” sung by Harry Caray. I ALWAYS sing along. You really hit a chord here, Lloyd. Music has always been important in my life and certain songs immediately bring back memories, smiles and an occasional tear. There are so many that it is difficult to mention titles. You mentioned Sting in your blog and I immediately thought of his ‘Fields of Gold’ that I heard over and over again in Hawaii in 1993 when we were celebrating our 20th wedding anniversary. ‘In the Year 2424’ reminds me of the summer of 1969 when I had just finished college and spent the summer driving my new Karmann Ghia all over Europe. The Army base Kaiserslautern was our ‘home away from home.’ I love just about all of Simon and Garfunkel’s songs but especially Sound of Silence and Scarborough Fair, loved the folk songs of Peter, Paul and Mary (Puff the Magic Dragon, even my 4 kids knew all the words), Brown Eyed Girl . . . the list just goes on and on. Thank you for the memories. Me ould granny singing Mickey McGilligan’s daughter Mary Anne!